The Women in Tech Careers Event on Tuesday night at the Toppel Career Center demonstrated to young women that their dreams of entering the male-dominated world of technology can become reality. “What we wanted to do was engage in a discussion about just getting on with it and why you shouldn’t really be worried or kind of upset about what people say, because people are going to say a million things. Just go with things you enjoy,” Khuri said. The panel included four women and two men: Benoit Wirz, director of Venture Investments at the Knight Foundation; Claire Marrero, CEO of The Talent Source and president of ITWomen; Lynn Cherny, visiting Knight chair for the Center for Communication, Culture and Change at University of Miami School of Communication; Rebekah Monson, co-founder and vice president of “The New Tropic;” Christine Lisetti, associate professor of computer science at Florida International University and Brian Reece, associate director of UM’s Toppel Career Center. Each of their careers covers the technology spectrum from computer science to digital media and even capital investments. 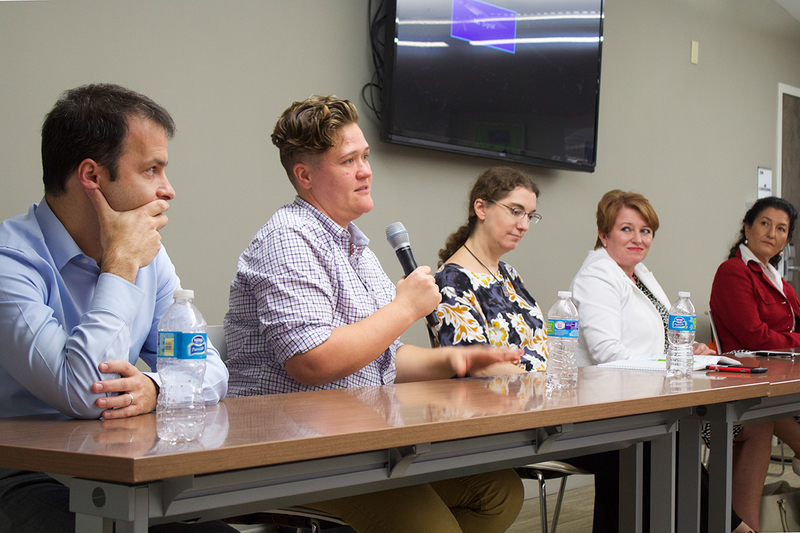 “There is great capacity in this industry for you to just skyrocket to wherever you want to go,” said panelist Monson, the vice president of “The New Tropic,” a website that connects people in Miami to media and social opportunities throughout the city. Monson told the audience that the great thing about the technology field is that anyone can work in it. She expressed her desire for women to break away from the idea that only scientists, mathematicians and computer engineers can enter the technology field. “I’m a journalist. I got into [technology]through all kinds of weird back roads, but that’s another great thing about this field,” Monson said. Not only did the event attract students and faculty from the university, but it also brought out students from Gulliver Academy, a private school in Coral Gables that teaches students from kindergarten through eighth grade. Gulliver Academy has created an engineering course specifically for girls, and the class came to hear the panelists for a field trip. “Since many women aren’t doing engineering a lot, we wanted to learn more about it so we can pursue it in the future,” said Valeria Tormo, an eighth grader at Gulliver Academy. After the discussion, there was a networking reception where audience members could interact with panelists on a more personal level. Ibis Arrastia, the chapter leader for Girls Develop It, a non-profit organization that provides affordable programs for adult women interested in learning web and software development in a judgment-free environment, was there to support the event’s cause and network with women who might be interested in her organization. “I work a lot with women in tech and am trying to get women to like technology and try it out. It’s one of my passions, so I definitely wanted to be here and see how I can lend support,” Arrastia said. The networking reception was an opportunity for emerging technologists and veterans in the industry to mingle and share experiences. “I’ve been a computer engineer for 24 years, but it’s always been inside of a cubicle. I don’t really meet other women doing this, so, I just love the opportunity that’ll be able to talk to some other women who’ve had a big, long career like me and hear what similarities and differences we have,” Arrastia said. The wide range of women in the technology field revealed the many possibilities accessible to young women. “Representation is obviously important, so you can see that other people have pioneered the way for you; it’s basically like standing on the shoulders of giants,” said Kayla Shirley, a freshman majoring in computer science.